When we moved earlier this year, I found a drawer full of forgotten kits. One of my new goals is to complete all of the kits — or at least move them along one way or another. After sorting through the contents of my great-grandmother’s treadle sewing machine cabinet, I’m more mindful of how random our materials and supplies can appear to others, even other makers. I’ve found myself asking repeatedly why she was keeping certain items. Were they important, or did they just end up forgotten in a drawer? 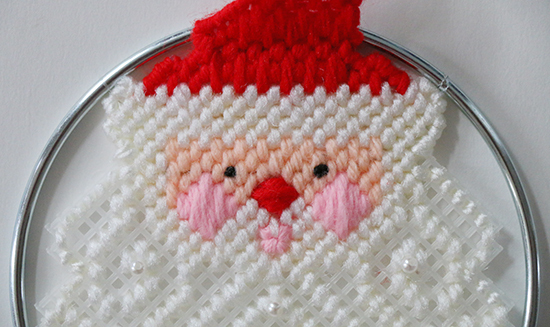 First up is a plastic canvas needlework kit from the Canvas Capers line by Leisure Arts, #427 Shimmer-Ring Santa Claus. To give you an idea of just how forgotten these kits are, this one has a copyright date of 1982. Even after being packed away from sunlight for so long, you can see that the lower half of the instruction sheet has discolored. Over the years, I’ve made projects in a wide range of media — from blown glass to underwater basket weaving — but I’ve never worked with plastic canvas. I discovered that plastic canvas needlework is relatively easy to learn; the entire project took only a few hours to make. The beard stitches presented a challenge to ensure that no extra strands of yarn would show through from the back to ruin the design. 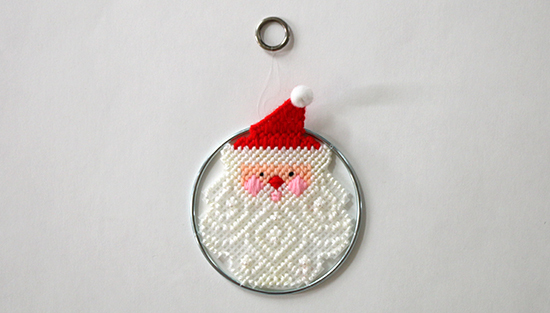 This decoration is on the large side for a tree ornament with the outer ring at five inches (12.7 cm) in diameter. The length from the top of the hat to the bottom of the ring is 6 1/2 inches (16.5 cm). The thread length for the hanging ring is up to the maker; mine is about three inches (7.6 cm). It makes me smile. And that’s something it would have never done from the bottom of a drawer. Thank you! Yes, I'm looking forward to really going through the rest of the kits. Not a word either of us probably ever applied to Santa before, but I agree, thank you! 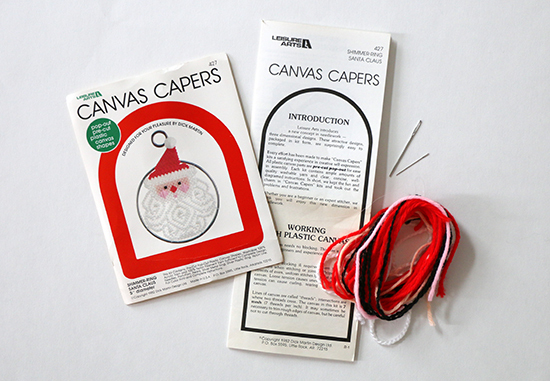 What a fun little kit for you to try plastic canvas stitching! I am currently working on finishing up some felt angel from a kit dated 1988. But they are done and sooooo cute! Yes, it was a great learning project! It's nice that these kits hold up so well. Congratulations on finishing your angels!